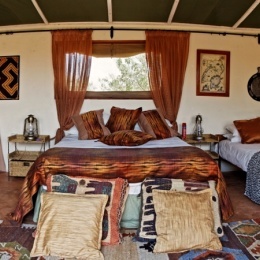 A small cottage with two rooms, a shared toilet and an outdoor shower on a private terrace with lovely views of the Conservancy. The second room either serves as a sitting area or a bedroom for 2 people. On the shores of one of the most beautiful lakes in the Great Rift Valley, Lake Elmenteita, lies a vast, extinct volcano. Seen from the distance, its time-eroded crater suggests the profile of a massive Maasai warrior. At the foot of the volcano, surrounded by 20,000 hectares of the private Soysambu Conservancy, lies the Sleeping Warrior Camp. The camp offers a selection of tented rooms as well as a stone-built guest house and a romantic hill top escape with roll-out star bed. There are seven widely spaced rooms. Each tent is locally-made and eco-friendly. All have thatched roofs, canvas interiors and private or ensuite stone-built bathroom facilities with flush toilets, sinks and hot showers. Electricity is solar powered. The comfortable beds are provided with continental quilts and fine-quality linen. Each tent has its own private furnished terrace. Raised on a small incline, with evocative views towards the lake and the Aberdare Mountains beyond, is a simple building, styled to replicate a Tuscan villa, and made almost entirely from straw-bales from the surrounding cattle ranch. This houses the central lounge, dining room and breakfast terrace. Meals follow a set menu, which typically features three courses and a choice of vegetarian options. The restaurant area also features an outdoor terrace with camp fire pit and safari seating and a safari bar. Sleeping Warrior also offers a wide range of bush dining options. 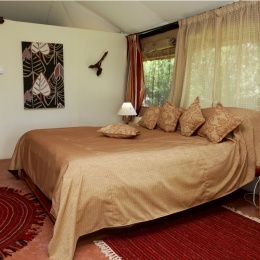 The Sleeping Warrior offers a variety of activities like game drives in Soysambu Conservancy and Nakuru National Park, night game drives, bush & lake walks, volcano climbs, birdwatching, sundowners, children's activities and meals in the bush. Or you can relax by the pool at our sister property, The Sleeping Warrior Lodge.